HTC attempted to make an impression in the ever-growing phablet market with the HTC One Max, a smartphone that featured the award-winning design aesthetics of the HTC One around a beautiful, large 5.9-inch display. Getting a grip around such large devices can be a little difficult, and there is definitely more of a chance of an accidental drop. While there are a lot of great accessories for the HTC One Max, because protection is of paramount importance, today, we’ll be concentrating on one type of accessory in particular – cases. Be it for style, convenience, and of course, protection, here are some of the best cases for the HTC One Max. Let’s get started! 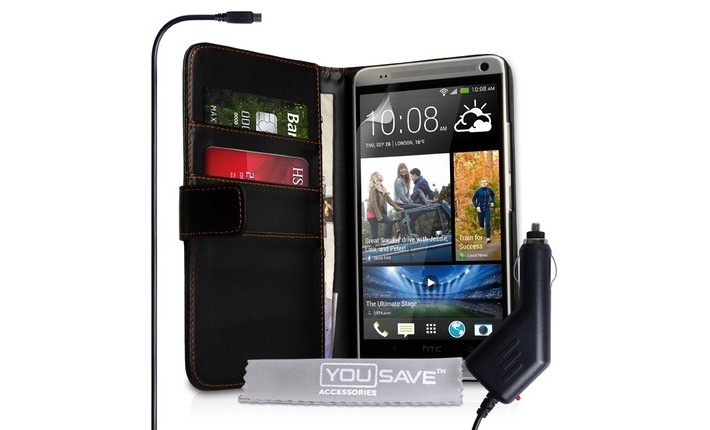 Just added: A best list featuring some of the best HTC One (M8) cases. The Cruzerlite Bugdroid Circuit cases are made from shock absorbent and scratch resistant TPU, and adds practically no bulk to the device. A raised bezel around the front of the phone protects the screen while face down. Precise cutouts allow easy access to all ports and the fingerprint sensor, and while the buttons are covered, they are still easy to press. The Bugdroid Circuit case is available in numerous color options, including clear, black, blue, green, teal, white, orange, red, and purple, to name a few. Buy now on Amazon for $12.90. The Diztronic Flexible cases are made from TPU, a material which is flexible, but stronger and more durable than silicone, allowing for good shock absorption and abrasion resistance. These cases are also very thin, and add negligible weight to the device. The volume rocker and power button are covered, and the case also features a raised wrap-around design around the top of the device, helping to protect the display from face down falls, or if the case is kept face down on a surface. Buy now on Amazon for $11.95. The Incipio Feather Case features a rigid Plextonium frame that adds protection while remaining slim and inconspicuous, and like the other slim fit options, adds minimal bulk and thickness to the device. The soft touch finish allows for enhanced comfort and grip, and its snap-on design makes the case very easy to install and remove. While stylish, the buttons are uncovered and there are a few open areas at the front and so, this case isn’t as protective as the others, and definitely not for the clumsy. Buy now on Amazon for $14.25. The Incipio DualPro case offers dual layer protection with its impact resistant silicone core and a hard shell Plextonium frame. The buttons are covered, but easy to press and has a large cutout at the back for the camera and the fingerprint sensor. The case offers great overall protection without adding too much bulk. The Incipio DualPro is available in multiple color options, such as white, black, pink, and cyan. Buy now on Amazon for $19.25. The Fosmon HYBO-DUOC case also offers dual layer protection, and features a silicone core and a polycarbonate shell, for protection against accidental drops and spills. Even with the added protection, the case is still lightweight and durable. Precise cutouts give you access to all ports and the fingerprint scanner, while the volume rocker and power button are protected. The Fosmon HYBO-DUOC case is available in multiple color combinations, including white/black, pink/white, grey/yellow, and blue/pink. Buy now on Amazon for $5.97. The Cover Faux Leather Wallet case features a super slim and understated design, providing the perfect blend of protection and sophistication. The exterior features a premium PU leather material, with the phone easily snapping into the rubberized housing, that keeps the device securely in place. The case comes with a built-in folding stand functionality, allowing for media viewing in landscape orientation. The flip cover is held in place by a strong magnetic clip. Finally, you also get three card slots for credit cards or ID. Buy now on Amazon for $10.95. The Poetic Flipbook case features a soft rubberized surface with a leather-like texture on the outside, and a hardshell polycarbonate frame that wraps around the device, for extra protection. The interior lining is a soft microfiber material, keeping the display scratch free, and also features suction cups to keep the cover closed, which reduces the risk of the screen being left exposed in case of an accidental fall. Cutouts give easy access to the headphone jack, ports, camera, power button, volume rocker, and fingerprint scanner. You also get three card slots for credit cards or ID, and an open pocket for cash. The Poetic Flipbook is available in different colors, including black, white, blue, pink, yellow, and green. Buy now on Amazon for $4.95. The Yousave Wallet case is manufactured from the highest quality PU leather, and gives you a durable and stylish option for protecting your device from damage. The phone snaps easily into the plastic holster, which holds it firmly in place. A magnetic clasp keeps the flip cover closed and precise cutouts give you access to all ports, buttons, and the fingerprint sensor. You also get three slots for credit cards or ID, and a large pocket to hold any cash. Additional accessories available with the case for free are a microfiber cleaning cloth, a screen protector, and a microUSB car charger. Buy now on Amazon for $12.49. The Poetic Invictus Hybrid case for the HTC One Max fuses the protection of a hardshell, and the grip of a rubberized covering into one great case. This innovative case with a honeycomb inlay, also features a built-in kickstand for multiple viewing options, ideal for media consumption on such a large device. Precise cutouts give you access to all ports, buttons, fingerprint scanner, and camera. 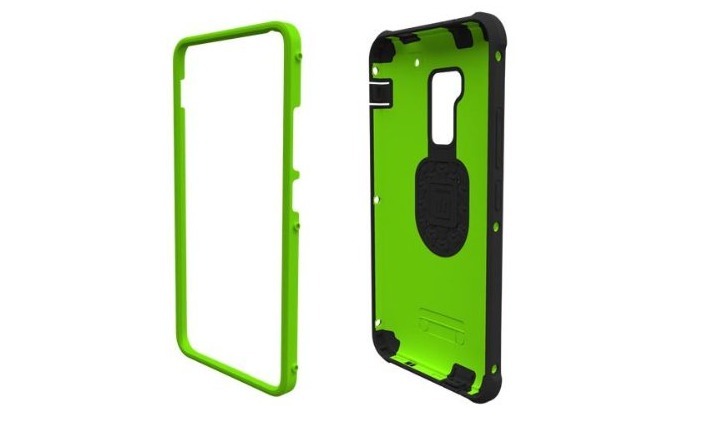 This case is available in two color options, white and black. Buy now on Amazon for $14.95. 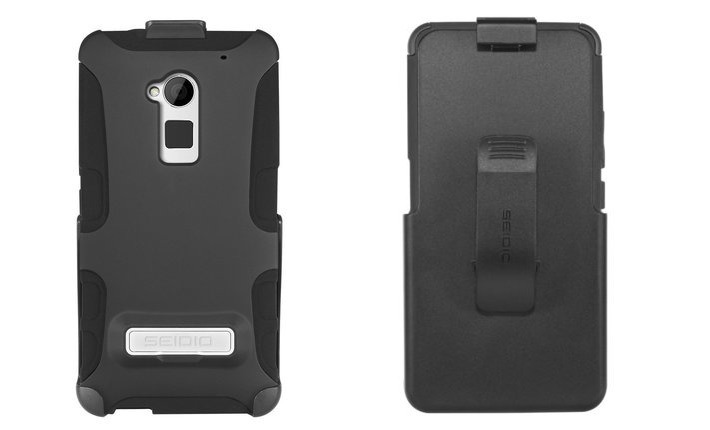 The Seidio DILEX case provides shock absorbing protection with two interlocking layers in a thin case, adding an overall thickness of just 2.2 mm, with the build material providing users with improved device grip. The case also features the additional benefit of a magnetic metal kickstand, perfect for hands-free multimedia viewing in landscape orientation, which snaps back into place easily when not in use. The DILEX case comes with a felt-lined holster with a face in design that keeps the screen protected when holstered. A clip at the top allows for easy access, and the belt clip swivels in seven different directions. Buy now on Amazon for $41.11. Otterbox is well known for its ultra-protective cases for high-end smartphones. Unlike the heavy duty Defender cases, the Commuter series offers the perfect compromise between protection and form factor. The case features dual layer protection, silicone plugs to cover all ports, and easy access to to all buttons, which are also protected. Also included with the Commuter case is a separate self-adhering screen protector. Buy now on Amazon for $44.95. The Trident Cyclops case offers the best of both worlds, combining features of the Aegis and the Kraken series, with the Cyclops boasting the same superior protection meeting military standards for vibration and drop tests, along with the relative sleekness of the Aegis case, but with a built-in screen protector. This also case features protection for device power-ports and audio-jacks with TPE plugs to keep out dirt and debris. Buy now on Amazon for $26.99. The HTC One Max features a large 3,300 mAh battery, but if you’re looking for some extra juice, along with great protection, the new HTC Power Flip case is the best choice for you. The sleek Power Flip Case features a 1,150 mAh battery that provides an extra boost when the case is wrapped around your device. 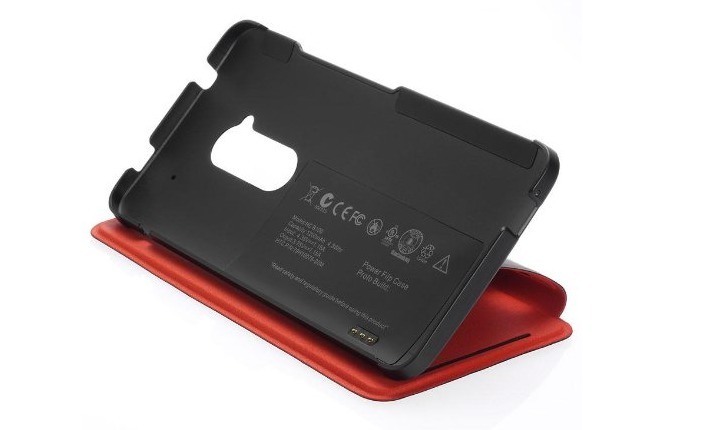 A device battery icon shows up when the full-screen protective case is in use, and a green LED display indicates when both your case and phone are fully charged. Buy now on Amazon for $82.49.